The whole point of an internship is to learn and gain experience in your field of interest, and to possibly advance the internship position into a job after graduation. When I was offered a position to be an intern for the Summer Associates Program with UPMC, I was so excited to have the opportunity to gain more knowledge in my field of Health Management Systems, as well as to meet many new people that are already experts in my field of study. You are not expected to be a polished professional when you begin your internship. You are, however, expected to bring enthusiasm, a strong work ethic, and a willingness to learn! First things first, make a good impression. Arrive on time, or even a little early. Dress professionally. A key to dressing appropriately is to observe your co-workers as well as checking the dress code before you begin working. Put effort into learning more about UPMC as an organization (ex: mission statement) and not just your placement within UPMC. Determine what you want to learn from your internship. Coordinate your own goals with your mentor or manager and set specific goals for completing your projects to know what is expected of you to finish by the end of your internship. At the end of the internship, ask for feedback on the work you have done. Ask for constructive criticism and accept it. Ask your mentor questions. If you are unsure about how to complete something you are assigned to do, ask for clarification. It is better to ask more questions than to end up doing it wrong. Your mentor is there to help you make the most of your internship. Treat your internship as though it is a full-time permanent position. You are contributing to UPMC, and should perform your best work. Especially with the Summer Associates Program, the projects you complete are frequently implemented within the workplace. If you don’t have anything to work on one day, ask your co-workers if there is something you can help them with. Go above and beyond your assignments to learn new skills. It will show you are proactive, ambitious, and valuable to the company. Shadow other people throughout your workplace to learn more about other career options you have with your major. Those people you shadow will serve as great contacts even after your internship ends. Build good relationships with your mentor, your manager, other employees, and all of the other people you meet throughout your internship. All of those relationships will assist you in establishing yourself when you actually begin your professional career. Attend any service events or other meetings throughout the internship. Be involved. These events will allow you to meet more of your peers as well as many leaders of UPMC. Keep a list of your projects, tasks, meeting notes, and accomplishments. Write down everything you do and keep a record for your portfolio. The portfolio with samples of all of your projects as well as other accomplishments is fair game for interviewers to ask further details about. It will be very helpful when updating your resume as well. Close to the end of your internship, speak with your mentor if you are interested in working for the organization. In closing, internships are a great way to get your foot in the door, and learn real-world lessons that cannot be taught in the classroom. 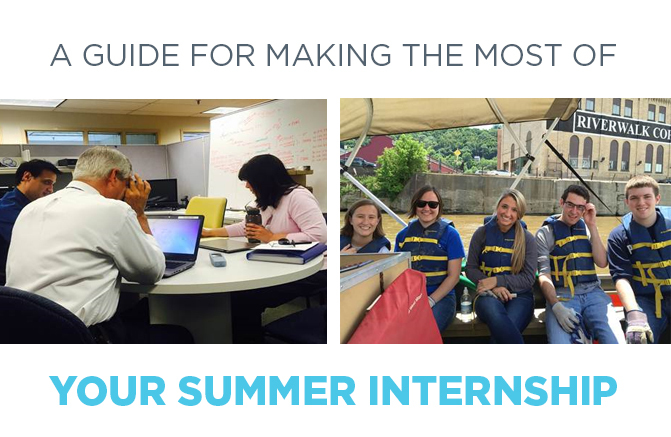 These tips can help you make a strong and lasting impression on your summer officemates. And if you’re lucky, they could even be your future co-workers if your internship goes well!